As consultations are still ongoing to form a new government in Algeria in a bid to address the wrath of the people standing against the extension of President Bouteflika’s term that the protesters call a “fourth term bis”, the Bouteflika clan must face another front of “resistance” from within. Actually, 72 high dignitaries of the ruling National Liberation Front (FLN) signed, Sunday (March 17), a statement in which they voice support for the “awakening of conscience of the popular masses”. The 72 mouhafedhs (FLN leaders at the regional level), out of 120 in the country, were clear in their support for the popular protests against Bouteflika. In their statement, the dignitaries hailed the popular protest movement, saying they support all the legitimate claims and distance themselves from the statements made by the president of “the unlawful leadership” of the party. 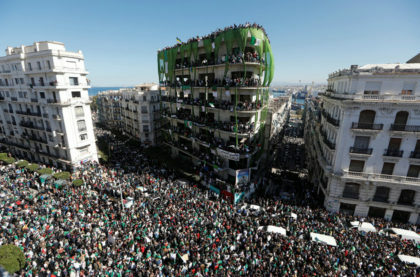 “We warmly welcome the awakening of conscience of the popular masses, as well as their sense of responsibility and civilized behavior, which express in all sincerity the aspirations of the Algerian people to build a democratic and modern state, rooted in justice and freedom,” the signatories added, calling for new elections to replace the “illegitimate leadership” of the party that has ruled the country since its independence. Also on Sunday, Former Prime Minister Ahmed Ouyahia, who was until recently a cacique of the Algerian regime and who was sacked only last week, expressed support to the protesters and asked the regime to “respond as soon as possible” to the demands expressed by the Algerians. Ahmed Ouyahia, who played a leading role in the country’s politics as President Abdelaziz Bouteflika’s chief of staff during several years before he was appointed Prime Minister in 2018, has expressed his sympathy with the demonstrators, who call for a regime change, in a letter he sent Sunday to the militants of his party, the RND. In the letter that was published by the Algerian media, Ahmed Ouyahia calls the authorities to “respond as soon as possible” to the demands peacefully expressed by the Algerians against the system in place. He calls on the authorities to “respond as soon as possible, in order to avoid Algeria a drifting” (in the unknown). Ouyahia has thus joined the growing clan of those who utterly changed or softened their positions with regard to the protesters, including Ahmed Gaid Salah, the army’s Chief of Staff and Deputy Minister of National Defense. Ahmed Gaïd Salah actually distanced himself from his own stands at the beginning of the protests that started on February 22 when he had threatened to crackdown on the demonstrations. Today, “the people and the army share the same vision on the future of the country”, Ahmed Gaïd Salah had declared a couple of weeks later, precisely on March 10. Another influential component of the Algerian power, the Mujahideen or Resistants, represented by the National Organization of Chouhadas’ Children, the National Organization of Mujahideen, the Association of the elders of MALG (intelligence service of the National Army of Liberation during the war of independence), have also deserted the Bouteflika clan. Since the start of the demonstrations, these organizations announced the withdrawal of their support to the regime and denounced its maneuvers to “perpetuate a system that has reached its limits and risks to lead the country to most serious dangers”. Several local branches or unions affiliated to the powerful UGTA (General Union of Algerian Workers) have also distanced themselves from the union chief, Abdelmadjid Sidi-Said, who is a staunch supporter of President Bouteflika. Resignations were also announced in the Forum of entrepreneurs, an employers’ organization led by Ali Haddad, who is very close to Saïd Bouteflika, the President’s brother. Algeria has been embroiled since February 22 in a political crisis sparked by President Bouteflika’s plans to run for a fifth term in office despite his health conditions at the April 18 presidential elections. To calm down protests, Bouteflika scraped his candidacy plans, and instead postponed the elections sine die and proposed a transition to be marked by a national conference to discuss a new constitutions. However, the move did not abate the demonstrations, while opposition parties, including Talaie El Houriat of former Premier Ali Benflis, the country’s largest Islamist part, MSP, of Abderrezak Makri, and the Workers’ Party of Louisa Hanoune continue to call for the withdrawal of Bouteflika and all his entourage from Algeria’s political life as a pre-condition for the transition. Meanwhile, the corporations of doctors, magistrates, lawyers, journalists, teachers, as well as students continue their mobilization on the street as well as on social networks, calling for an end to time-buying manoeuvers and for a regime change in their country.